Grease a 20cm springform tin with butter or non-stick cooking spray. Crush biscuits into fine crumbs using either a food processor or by giving them a good whack with a rolling pin on a clean kitchen bench. Add the melted butter to the bowl of crumbs and stir until all mixed together. Pour the biscuit mix into the greased tin and spread it evenly around the base only, packing it down firmly with your fingers. Make sure you pack it well around the edges. Place the tin into the fridge to set. Meanwhile, preheat the oven to 160°C. Dice up the cream cheese and beat until smooth, by using a food processor or stand mixer. If the cream cheese is still too firm, place the outside of the bowl in hot water to help soften the mix. Once the cheese is silky smooth, add the sugar gradually until all combined. Add each egg, mixing well after each addition. Pour in the lime juice and beat until just combined. The mixture will be quite thin and easily pourable. Take the biscuit base out of the fridge. Pour the cheesecake filling over the base and spread it around evenly, smoothing the top. Bake for 45-55 minutes – the cheesecake should still have a slight loose wobble in the centre when you remove it. If in doubt, take it out I reckon. Leave it to cool while you make the meringue topping. Turn the oven up to 220°C. Put the egg whites into clean bowl with about 1/3 of the sugar and beat until soft peaks form. If you are using an electric whisk start on slow speed and very gradually increase the speed after a minute or two at each level. Once you have soft peaks, gradually add the remaining caster sugar and beat until the peaks are glossy. Gently fold in the coconut so you don’t lose any of the air you’ve worked so hard to beat into those egg whites! 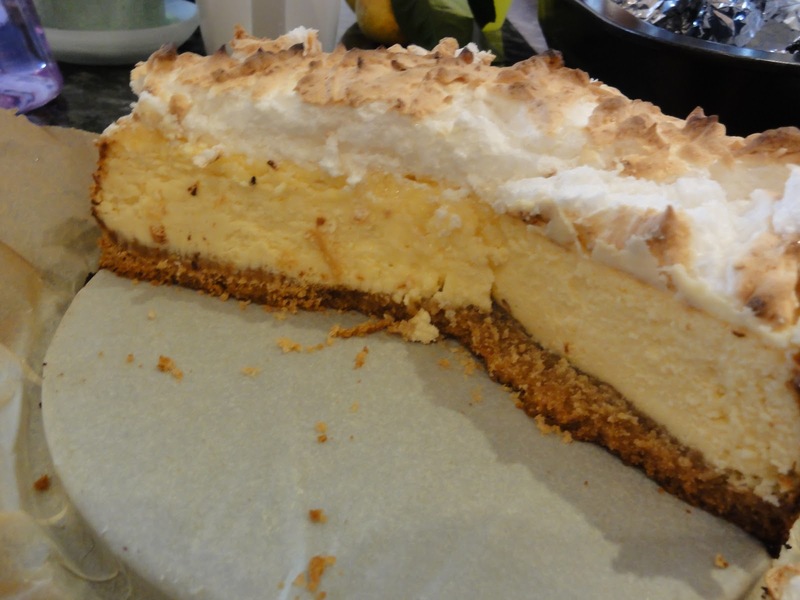 Spoon the meringue onto the middle of the cooled cheesecake and spread it evenly across the surface using the back of the spoon. It’ll be about 2cm thick. You can jazz up the meringue by adding some swirls or spiky peaks by quickly daubing the surface with the back of your spoon. Bake for 5 minutes or until the meringue starts to turn golden and firm to the touch. Let the cheesecake cool a little, then refrigerate in the tin for at least 2 hours to chill before serving. When ready to serve, carefully remove from the tin and sprinkle the freshly grated lime zest on the top (which I forgot due to serving in a rush :p). I reduced the recipe by half for all ingredients. The original recipe makes for one 24-cm cake tin. Since I only have a 20-cm cake tin and not many people to eat them, reducing the ingredients by halve fit perfectly for a 20-cm tin. And it turns out to be the perfect size too. Not too much and not too little. If you are having many guests over at your place, feel free to make a bigger cake by multiplying all ingredients by 2 and use a 24-cm cake tin or slightly bigger. You should! Have you tried making the cheesecake yet?